KoopaTV: Fiction Can Influence so Please Stop Overshadowing Girafarig (Also Pictures From My Vacation)! 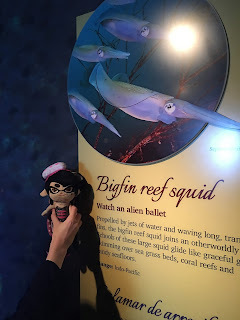 We see the bigfin reef squid is listed there as well along with the striped pajama squid which was not listed in the first link I posted. I was worried that previous squids were taken off display and then I will not see them by the time I get there and the aquarium says that if they feel the animals appear ill, they will remove them from display. I was afraid of the idea that I won't see them after traveling from so far and overcoming so many obstacles just to get there. If you have been reading my comments you may know that at this point in time I am expecting. I also had a previous loss and I am also having a hyperthyroid so my endocrinologist was not sure if it was safe for me to fly.I did not want to wait until after the baby is born because then it would be so much harder to travel with a newborn. Thankfully I got the clear to go by a doctor who actually does prenatal, delivery and postnatal care so I then got the tickets. I still did not want to end up traveling so far just to come to an aquarium without the squid exhibits, especially the bigfin reef squids. 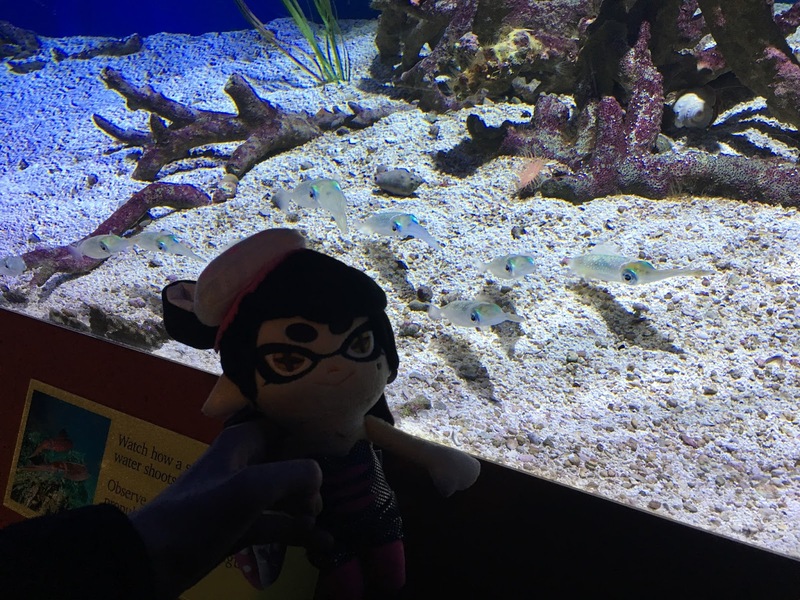 You see Callie's Japanese name, Aori, translates to "bigfin reef squid" so I thought it would be adorable to pose my plush Callie with them. What do you know, I managed to pull it off. 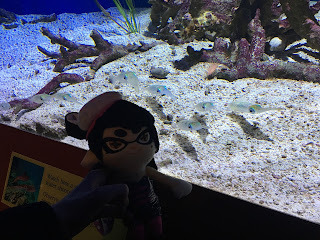 Callie's really enjoying her time looking at the squids she is named after. Here is one with Marie in it, but Marie appears to be uninterested. 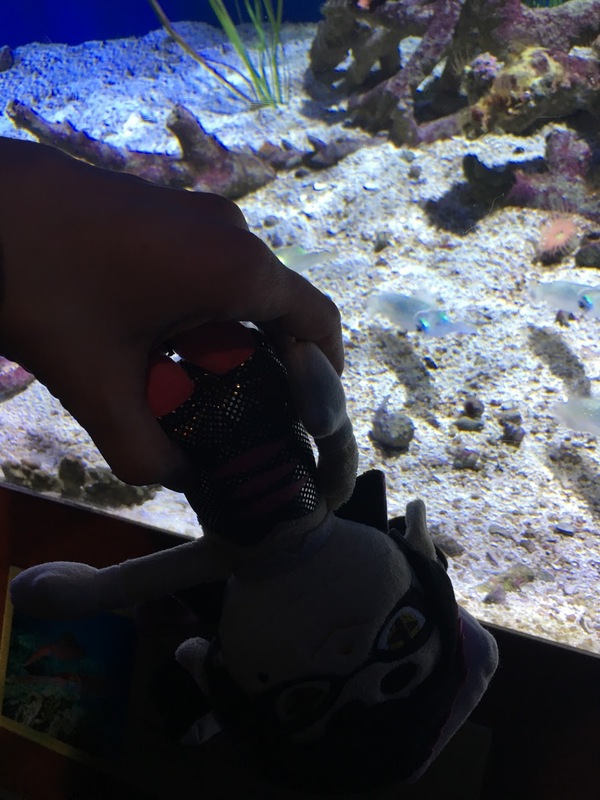 Probably because her Japanese name, Hotaru, translates to "firefly squid" and there were none on display there. Here is one without the Cephalopod Cousins in it. I find the (real life) squids very pretty to look at. Luckily for Marie, there is a museum completely devoted to what she is named after called the Hotaruika Museum in Japan. I do not think Marie would really enjoy it though since animal cruelty laws seem to be much more lenient in Japan. Look, someone is pulling out a firefly squid out of the water. They have not evolved yet to breathe out of water. I do plan to visit Japan one day so I plan to visit this museum too. Will I torture the firefly squids as well? So, Splatoon had a positive influence on me. I have not been interested in aquatic life at all until this game. Fiction such as video games can promote good values. Disney's animated film 101 Dalmatians in the past influenced people to get dalmatians for instance, though I read those breeds are high maintenance so maybe it was not a good influence anyway. The Pokémon Company came out with a new trailer on version exclusives for Pokémon Sun and Pokémon Moon. One of the version exclusives has a Pokémon based on an orangutan called Oranguru for Pokémon Moon. This Pokémon has the typing of Psychic and Normal, the same dual typing as Girafarig. Girafarig is already not-so well-known, but its typing gave it some use for mono-based Psychic teams that needed to be immune against Ghost types, so it gets some recognition. Then Meloetta came along who also had the same typing and starts out in battle with that typing, even if you plan to use the Pirouette Forme which changes it to a Normal-and-Fighting dual type. Now people will have a choice for a Psychic type that is immune to Ghosts. Then Oranguru comes in to further foreshadow Girafarig. Just my luck to like an animal that is underrated, and the giraffe's lack of popularity carries on to the Pokémon based on it. Do you have any idea how long it took for giraffes to have an exclusive documentary devoted to them? It's always lions this and elephants that. Here is the documentary that released in Nat Geo Wild. It took until 2015 for this? Since giraffes aren't as focused much in the media, people think they are doing okay. Now they are dying out. 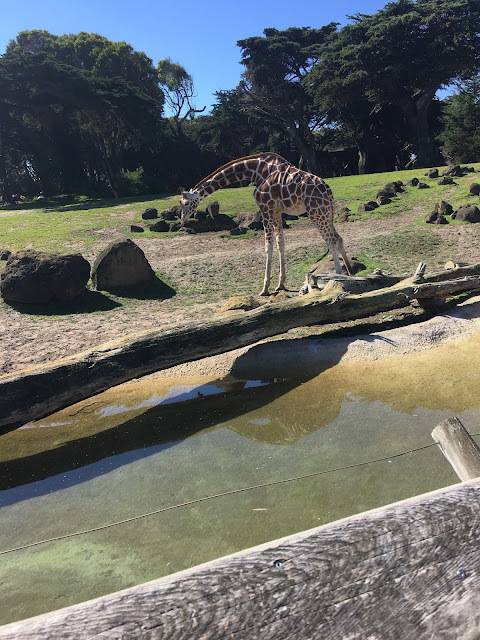 I was in the San Francisco Zoo and they also had a sign there about giraffes starting to be endangered, which I wish I took a picture of, had I known I was going to write this article. It is discussed on their site though, such as here. The point is all this overshadowing makes giraffes silently die out with barely anyone noticing. Pokémon introduced its players to many unknown species. How many knew Sandslash is based on the pangolin or what a pangolin even is? We keep getting Pokémon based on primates, cats, etc. but still only one Pokémon is based on the giraffe, which is a standalone Pokémon with no evolution or pre-evolution. Giraffes are not used much in the media as well. There is Gracie the Giraffe in Animal Crossing whom I feel people love to hate because the giraffe demands a lot of errands to be done. There is Melman in Madagascar from Dreamworks whom is depicted as a klutz and hypochondriac, hardly an appealing way to see a giraffe. There is the mascot Geoffrey from the Toys R' Us chain which is being overshadowed thanks to online shopping. I can barely think of any other well-known giraffe in the media. Even though Ludwig is against the media, the media is one way to help unknown endangered animals get noticed and hopefully have get their conservation efforts funded. The problem is the media is biased to what species it wants to promote saving. So if you want to use Oranguru, go ahead. Just remember that Girafarig exists and the giraffe as well, as quite a few other species are quietly disappearing just because they do not resemble you, your pet or a teddy bear. Look at this sweet, adorable giraffe. ShinyGirafarig can be found on Miiverse. She is sometimes frustrated that more often than not she likes unpopular things. Read ShinyGirafarig's first guest post, about Nintendo NYC's re-opening! The author is obviously an animal lover. How can she reconcile that with her husband's interests? Ludwig dedicated one of the minigames in The Wonderful 1237 to giving giraffe representation. ShinyGirafarig puts advocating for more giraffes in media into practice by advertising this giraffe-prominent Kickstarter. I'm not sure you are familiar with this or not but there's a Sophie the Giraffe Teether, and it is the second best-seller on Amazon. Giraffes never do get the love they deserve, so it's great to see them get some spotlight even if it only reaches a few people. Thanks. I plan to buy the teether for my soon to be born child. Oho! I live in a city in the vicinity of the Monterey Bay Aquarium! I used to go there with my family all the time, and for school field trips a couple of times. It's a really nice aquarium.